Spatial structures influence our movements, glances, encounters, our feelings and our behaviour. Materials and shapes transport stress and counter-stress, swarming and collapse, hard and soft, rigid and elastic, vertical and horizontal. Together with the artists and architects Aïcha Diallo and Lorenzo Sandoval, a collective sculpture is created in the workshop: a jointly built space with pointed corners, gentle niches, wobbly limbs and flowing surfaces – or what do you imagine? How do we start? Which part goes where? What sticks to what or repels each other? Where and how does each person find a place in the batch? Each new module changes the structure of our collective space. STREITBAUTEN is a participatory art and architecture project aimed at young people between the ages of 12-27. In cooperation with the intercultural meeting place Fresh 30 and Rückert-Gymnasium, the workshop series investigates, builds and uses architectures as social forms. The workshop will be held in German and English. Participation is free of charge. Registration required, please send an e-mail tocaring-for-conflict@queer-institut.de. 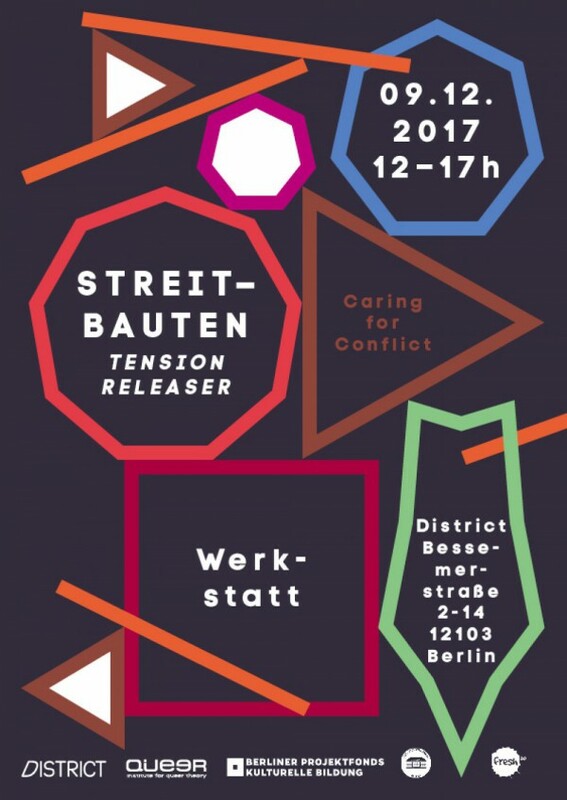 STREITBAUTEN is part of the cultural and political educational project Caring for Conflict – a cooperation between the Institut für QueerTheory (iQt) and the art space District Berlin, funded by the Projektfonds Kulturelle Bildung.